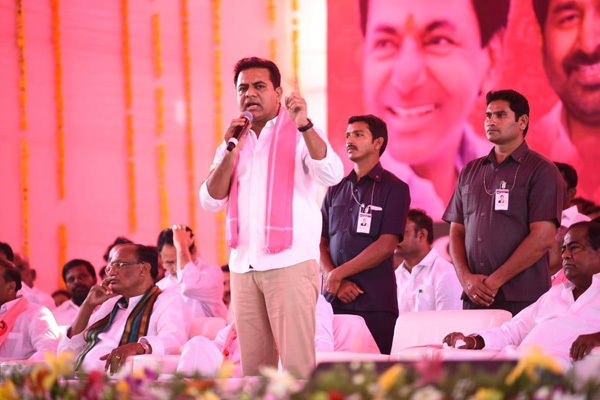 For the coming Lok Sabha elections, Telangana Rashtra Samiti is going to the people with a broad-based plan that will offer a far more comprehensive national development agenda than that is being offered by the so-called national parties, according to TRS working president KT Rama Rao. In an interview here on Saturday, Rama Rao said Chief Minister and TRS president K Chandrashekhar Rao will present this agenda at the launch of the Lok Sabha election campaign in Karimnagar on Sunday. “KCR had previously at our party plenary talked about the qualitative change needed in national politics. Governments over the past 71 years, whether led by Congress or BJP, were stuck in the rut of routine politics and failed to provide people with even the basic amenities. It is time for a qualitative change in politics,” Rama Rao said. You speak about how Telangana has become a role model for others to follow including the Centre. How does TRS plan to present its case to the national audience? Our slogan is ‘strong States make a strong nation’. Plans that emerged from KCR’s thoughts have been turned into concrete action in Telangana. And these have found resonance not just in other States but even Prime Minister Narendra Modi has indirectly acknowledged the wisdom of programmes launched by KCR. Just look at Rythu Bandhu scheme. It received accolades from top economists and agronomists such as Aravind Subramanian and MS Swaminathan. The fact that Modi, and even AP Chief Minister N Chandrababu Naidu whose day is not complete unless he pours scorn on KCR and TRS, implemented schemes on the lines of Rythu Bandhu, demonstrates how people across the country welcomed Rythu Bandhu and how the Centre and AP had no option but to give people what they saw their counterparts in Telangana are getting. We will place all the schemes and programmes launched by KCR before the people of the country. What is the campaign plan of the Chief Minister? K Chandrashekhar Rao has decided that he will address at least one public meeting in each Lok Sabha constituency. In some constituencies, he may address more than one meeting depending on the constituency size. He will tour the entire State and will directly interact with about 40 lakh to 50 lakh voters. He will explain why TRS needs 16 members in the Lok Sabha. The TRS will also make extensive use of electronic and social media for its campaign. What are your parameters for candidate selection? Candidates for Lok Sabha are chosen based on service to the people and party, loyalty, and discipline. In some instances, candidate selection may be contingent on who the opposing candidates are. Of the two constituencies reserved for STs, TRS will field one Adivasi candidate and one from the Lambada community. Our goal is not just to win 16 seats but also to increase our vote share from what we got in the Assembly elections. We also hope that some sections of the people who did not support us in the Assembly elections will this time come with us. What kind of a role do you foresee TRS playing in national politics? If you look at the current political conditions, it is evident that BJP-led NDA will be restricted to 150 or 160 seats. Even Congress-led UPA cannot get more than 100 or 110 seats. And in the unlikely event of these two joining hands, even then they will not have enough seats to form a government. Meanwhile, parties that are strongly opposed to BJP and Congress, such as Trinamool Congress, Biju Janata Dal, Samajwadi Party, Bahujan Samaj Party, YSRCP and others appear set to win between 100 and 150 seats. Under these circumstances, you should not be surprised if it is the people of Telangana who will decide on the person to hoist the National Flag on the Red Fort on next Independence Day. When the mandate given by the people of the country provides space for a political alternative to Congress and BJP, we will certainly play a key role. It is the people who elect the MPs, it is the people who elect the Prime Minister. Political parties are merely representatives of the people. What are the qualities that make KCR a leader who can drive the nation forward? KCR’s leadership in Telangana has given the State an ideal administration. This is an administration that is bound by its commitment to disciplined delivery of services that not only serve people of the State but contribute to nation building. The TRS government has displayed a discipline and commitment for the overall development of the country that even the so-called national parties have never been able to commit themselves to, let alone demonstrate their ability to do so. The fact is, programmes like Rythu Bandhu, Rythu Bhima, Mission Kakatiya, Mission Bhagiratha or several other welfare schemes have become the ideals for the rest of the country to emulate and follow. If this widespread benefit delivery is to be replicated in the rest of the country, it needs KCR’s thirst to serve people. We have already seen other States replicate some of what we are doing in Telangana. But the Centre holds too many cards that prevent States from following a development path that suits their local needs…. There is an urgent need for decentralisation of power. As things stand, the Centre holds too many strings in its hands, many of them which it has no business to do so. It is time for the Centre, irrespective of who heads that government, to realise that the time has come to allow States the freedom they require to deliver proper welfare to their people and ensure development. This is why KCR calls for a qualitative change in governance and the way politics are practised. In Telangana, we brought a slew of administrative reforms, be the reorganisation of districts or creating new gram panchayats. The more the voice of people at the local level can be heard, the better it is for development. It is time for the Centre to adopt a truly federal approach to development. All the subjects that are listed are divided into three categories, Central, State and Concurrent lists. The question KCR has repeatedly asked is the need for a Concurrent list that has resulted in friction between the Centre and States. For instance, the Centre lacks network that can contribute to the subjects of health, education and agriculture in the States. Then why should it still hold on to these subjects. Better results will be achieved when subjects like these are handed to the States. Also, the States’ share in taxes should increase and all decisions should be taken in a truly federal spirit. If federalism is restricted to lip service, it will not serve any purpose. There is a lot of criticism from Opposition parties, particularly Congress, that TRS is encouraging defections. Comments? It is not uncommon in politics that people change their parties. This is something that needs to be addressed politically. It is unfair to accuse TRS of encouraging people to leave other parties to join us. Is it not true that before the Assembly elections, one TRS MP and four MLCs were admitted into Congress? We did not try to bring down the roof and accuse Congress of ‘murdering democracy’. We believe that such changes happen in the course of politics and we faced the issue on the political field. It is common to witness people switching parties during the election period and now with the Lok Sabha polls round the corner, the same phenomenon is being witnessed. It is important to note that in the case of what is happening now, everyone who expressed interest in joining TRS, have made it abundantly clear that they are willing to resign from their MLA positions and contest on a TRS ticket. When this is the case, where is the question of immorality as the Congress is saying? It is for the Congress to examine from within the reasons why its leaders want to leave it. As one of its own leaders said, the party appears to have lost its ‘josh’.